Hope to speak to you soon! Kord Information Systems LLC ("us", "we", or "our") operates the https://TotalMarinaPackage.com website (hereinafter referred to as the "Service"). We may use your Personal Data to contact you with newsletters, marketing or promotional materials and other information that may be of interest to you. You may opt out of receiving any, or all, of these communications from us by contacting us. Under certain circumstances, Kord Information Systems LLC may be required to disclose your Personal Data if required to do so by law or in response to valid requests by public authorities (e.g. a court or a government agency). Our software has been in the field since 2010. Since then, the Total Marina Package has been utilized and trusted by marinas of all sizes including the largest public marina on the west coast. We designed our software to include industry standard features with a few exceptional features only offered by TMP. It's sort of a one size fits all thing, yet with a twist. However we absolutely understand that every facility has different needs. To that point, we offer custom software modifications. You've got a brand new toy but no experience. Not a problem, we offer 90 days free support from the get go. Ask questions, solve issues & get the training you need. We designed with the average user in mind, the UI is simplistic and organized. With that said the learning curve is minimal. Learn how the Total Marina Package can improve your business. Use an interactive graphic to give you a visual representation of your slips and their occupied statuses. Stay organized with a selection of status colors that represent different occupied statuses. Handle contact info, reservations, email confirmations and documentation (insurance/registration) with ease. The System helps you find, update and add any data. 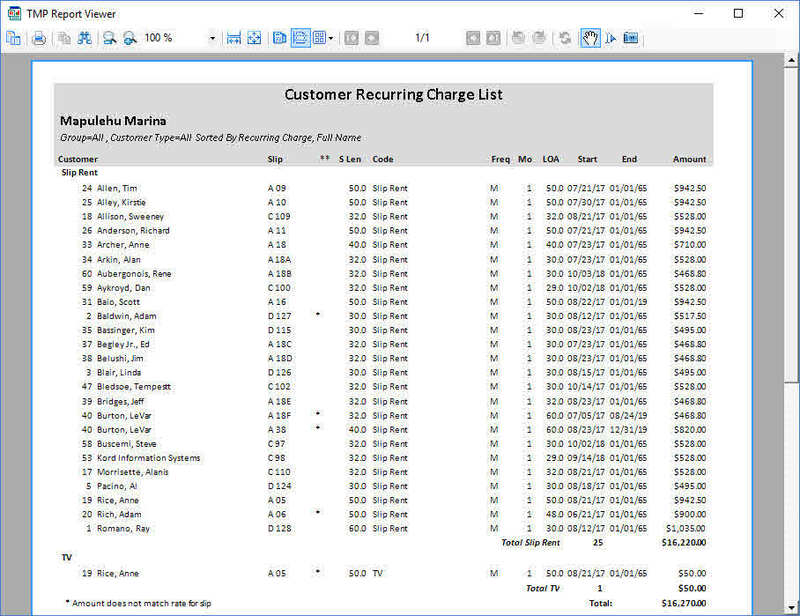 Set up customer billing in a manner you see fit. Take multiple forms of payment for any method of billing. Directly email from within the application to deliver invoices/statements & any correspondence. Alternatively, if you’re “old school” you can print and mail them. Observe and know exactly how your business is performing. With more then 200 variations of reports. Never miss an inch of your marina. The Total Marina Package's ability does not end there, there is much more depth to it. For a detailed & comprehensive list please click below. While our base installation provides you with the necessary tools to be successful, we do offer add-ons that will really up your game and take your marina to new heights. Besides the many customizable features within the Total Marina Package if you have a special requirement, no problem, Kord Information Systems is the author of the Total Marina Package and the only vendor willing and able to make program modifications to fit YOUR requirements. The Total Marina Package has partnered with Toye Corporation. This interface allows the Total Marina Package to talk directly with the Access Control system. With our interface, you can assign, activate, deactivate, add and delete keys, all from within the Total Marina Package. The Total Marina Package can generate Key information and access usage reports and store a picture of the key holder if you choose. 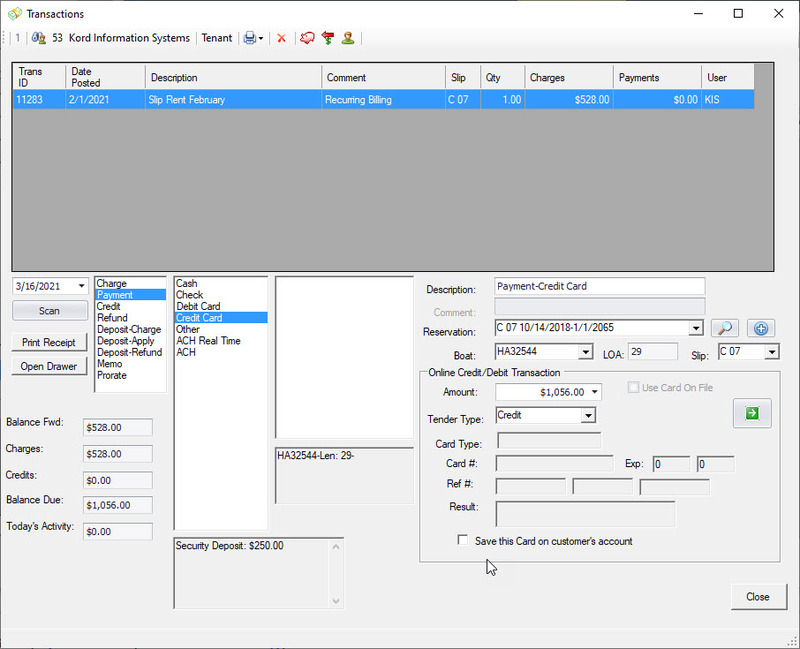 Kord Information Systems LLC the creator of the Total Marina Package has partnered with ChargeItPro , for its hosted payments solution. Using ChargeItPro if the Marina wants to accept a credit card payment using the Total Marina Package, a secure web page is opened allowing you to enter or swipe the card information. When you swipe a card the card information is immediately encrypted. The card data remains encrypted until it arrives at the processor, thus shifting the burden of having an elaborate secure infrastructure to the payment gateway and processor. With hosted payments, the Total Marina Package is not considered a payment application and therefore is outside the scope of PA-DSS compliance requirements. 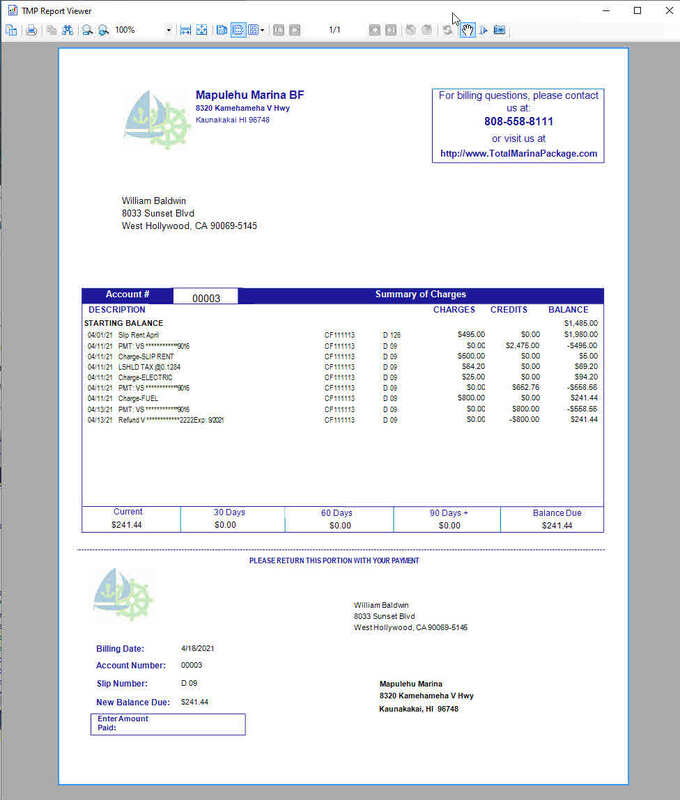 Find a report missing from the canned reports that come with the Total Marina Package? With the Report Designer you have the ability to create that report yourself! Just a little bit of logic ability and familiarity with report writing using Crystal Reports or anything similar is all it takes. The Report Designer comes with its own manual and training exercises. 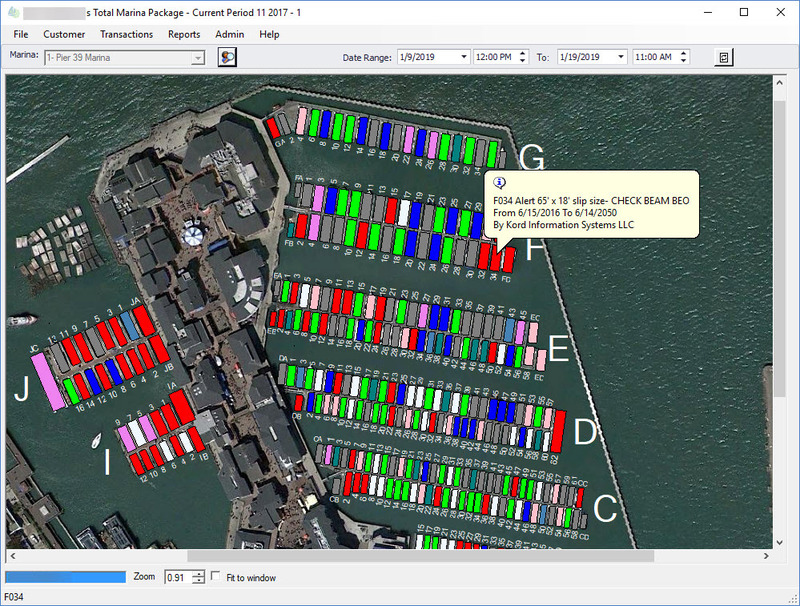 The Dock Check Inventory is a separate area in the database where occupancy is tracked based on a physical walk of your docks. You start with either a print-out or sync to a Windows tablet, both show who the system thinks is in each space. You verify it is correct or if it's not, is it a different boat, a new boat, etc...this information is reconciled on the tablet or the desktop. *Custom charging based on number of days in can be added. The Dockominium option allows you to track owners and tenants/leasers of slips. 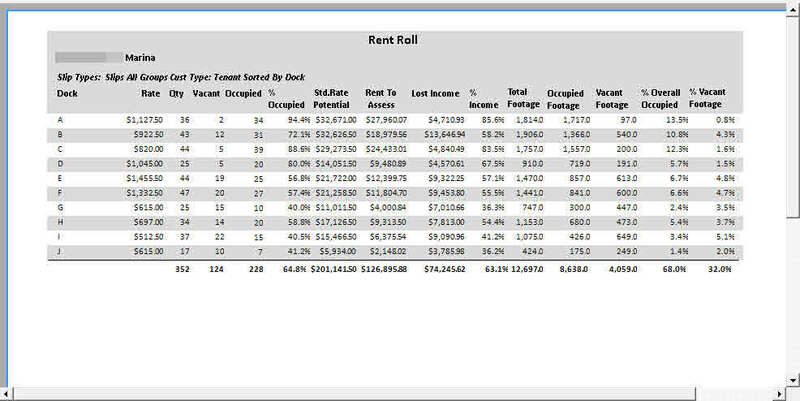 This lets you pay back the owner's a portion of rents collected from slip occupants. While an Owner’s credit report is provided which shows you who was in what slip and what dollars were collected for what charges. The use of a windows tablet eliminates the manual steps of writing the new reads on the listing and it also eliminates the manual entry of the new reads. 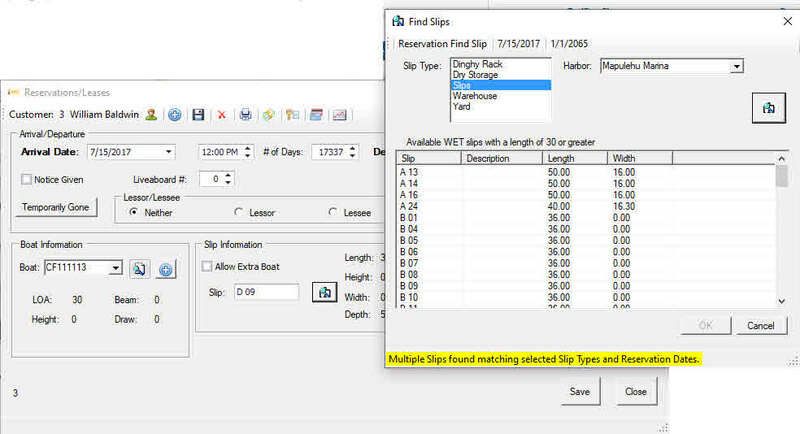 In addition the tablet has some built-in error checking and procedures for an entry to large, or usage on a vacant slip. The use of the RUM system by Marinesync, allows you to click a button and retrieve all your current meter readings. This can automatically create a batch of charges. 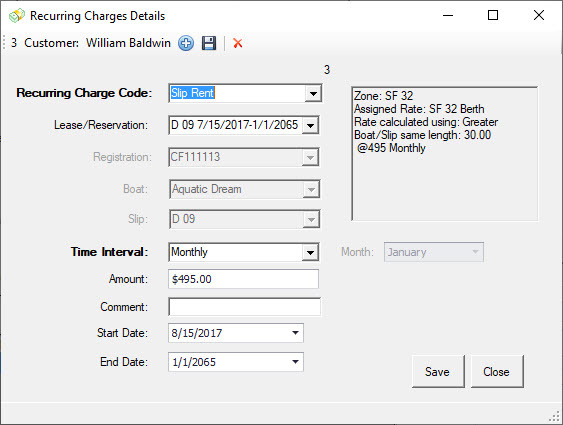 This option eliminates all manual reading functions, and the batch of charges is created with a button click. 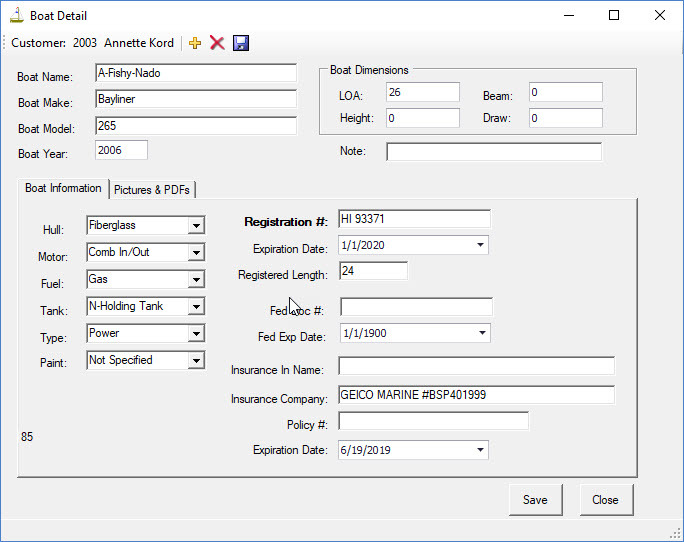 A hosted Online Application for your potential boating customers to submit their application including boat picture, insurance, and registration. The submitted application can easily be retrieved from within the Total Marina Package. If you have any questions about your particular hardware and whether or not they meet the minimum requirements please send a message and we can help you. We love to get feedback from current customers, we use it to improve our software. So have a read, word for word. "I have had the distinct pleasure of working with Annette Kord at Kord Information Systems for over the past six years. The Marina Management Software that she designed and utilizes has been seamlessly integrated into our systems. The TMP (Total Marina Package) software is very detailed, however, extremely user friendly. It is perfect for the 10 marinas that we manage. Annette provides detailed staff training (with manuals!) of the software, updates to the software when needed and outstanding technical support whenever we have a problem. We are more than happy with the product, services and support that Annette at Kord Information Systems provides and highly recommend her services." "The Port of Everett Marina is the largest public marina on the west coast with over 2000 moorage slips, 8 guest docks, a haul out and work yard operation as well as upland dry storage. We have been using The Total Marina Package since 2015. I have worked at the Port of Everett for 34 years so have experienced many software changes. These changes can be very challenging and what I have learned through these experiences is that the quality of the support is equally as important as the quality of the software. Having known and worked with Annette for 15 years I was confident in her ability to deliver both. She is innovative in her approach and very receptive to new ideas. Annette is quick to respond to any issues and has unique level of understanding of the marina/boating industry. We have been extremely pleased with the Total Marina Package and Annette is a pleasure to work with." "Homer's Port and Harbor is owned and managed by the City of Homer. We operate year round, are staffed 24/7, have 879 stalls that are leased annually, and have a very large and active transient fleet. 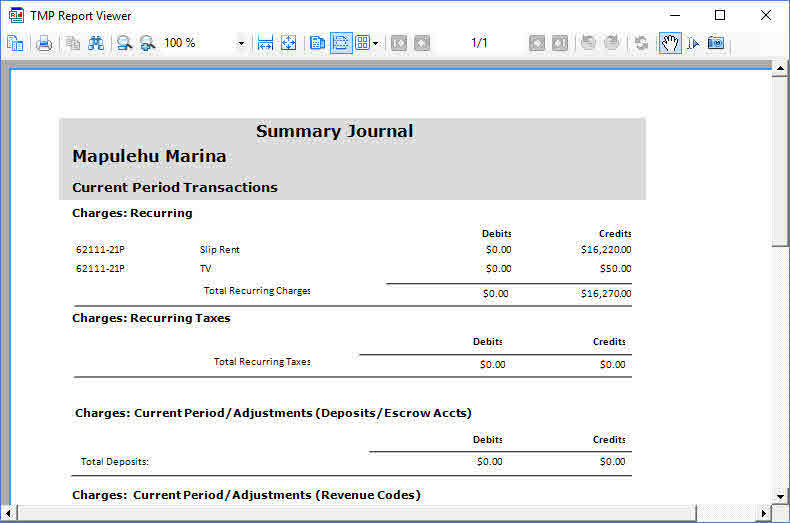 We launched the Total Marina Package software in June, 2018. The months of preparation with developer, Annette Kord to customize the program for our particular needs paid off with a smooth and stress free conversion. The program is user friendly with lots of reporting options and security features. Customer service after the install has been professional and prompt. I applaud Kord Information Systems and the Total Marina Package for their ethical standards and technical expertise." "I've been working with TMP since 2014 and have been very happy with the program. We have two marinas with 2000 slips total and the program has been very functional for us. The support that's offered with this program is the best I've dealt with. Phone calls/emails are answered very promptly and they act quickly to resolve the problem (if the problem wasn't a user error issue). I like the modules that come with the program that allow you to change the graphic interface and create custom reports. I highly recommend this software program." "We are the owner/operator of five marinas in the Southern California area. We've been a part of the TMP (Total Marina Package) family now for the last 8 years. This is one of the easiest, user friendly programs we have ever had the pleasure of using. This program offers so much beginning with a database that consists of as much information you wish to track, plus more. 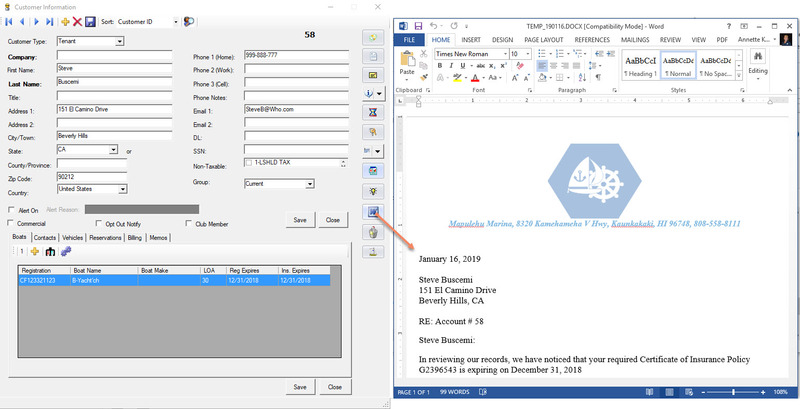 From this database you have the capability of creating your own customizable reports to merging data into word documents. 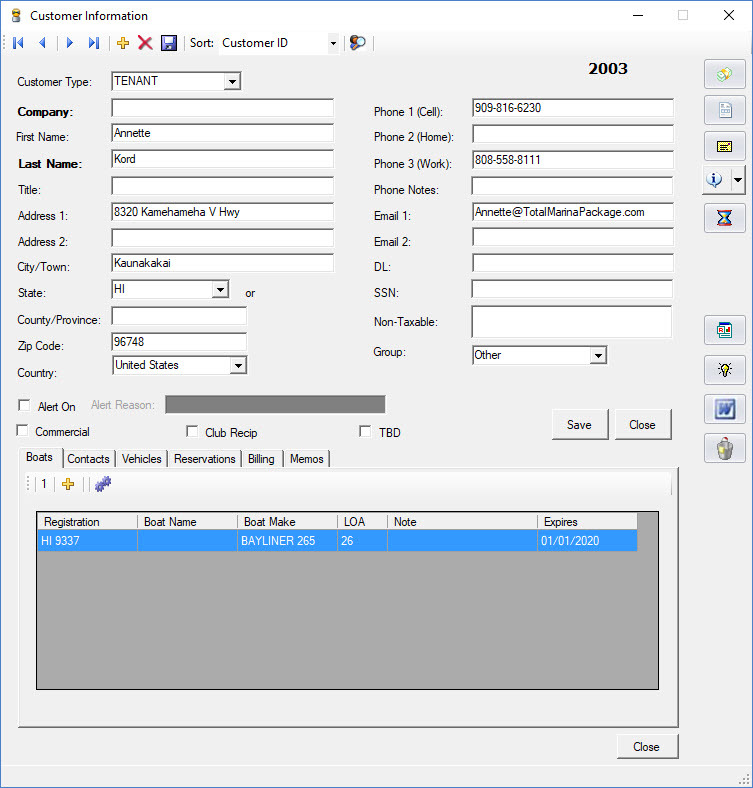 Plus email right from customer's account, with a copy automatically placed in the customer information file J. 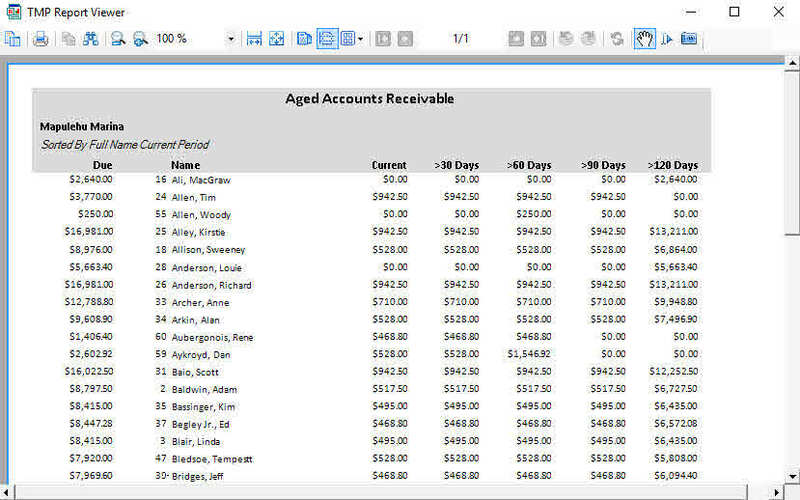 Program tracks all charges and income, with lots of automated features, including ACH. Very few problems, but if there is Annette is always there to help. In closing I just want to Thank You Annette for listening and assisting in all our needs. " We have your back, plain and simple. Here at Kord Information Systems we firmly believe that the support of a product is just as important if not more, than the product itself. To support that belief we give you 90 days of free support with every installation. This time could be used to ask questions, get training or familiairze yourself with TMP. Whatever it may be, we're right there with you. Dedicated email with maximum 24hr response time. Most issues solved within a day! We have a 24/7 emergency phone number to support customers for critical system errors. Online dedicated user portal available 24/7. Get software updates and software documentation. 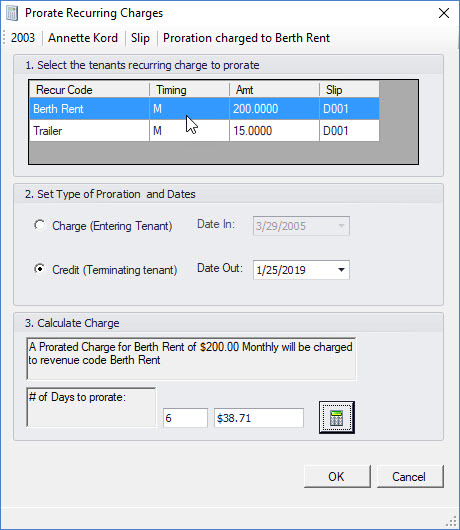 Remote software support available via remote connection software Teamviewer. Existing support customers may log in to the users portal with the button below or the button in the sidebar navigation. You've seen and heard enough, ready to get started? Have questions? Then send us a message below. Total Marina Package is an enterprise level solution built to help you grow and manage your business. 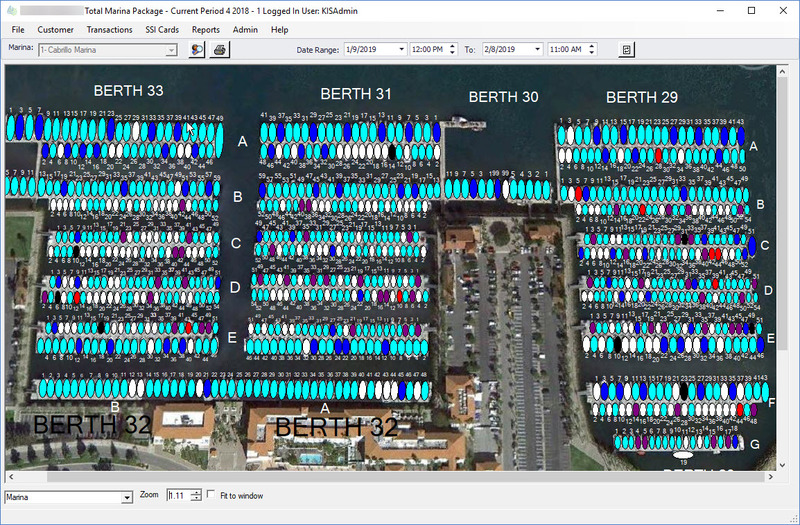 Our software was designed to accommodate any size, type or number of marinas. Since 2010 our software has been utilized and trusted by a number of marinas, including the largest public marina on the west coast. Will you be next?